Due to the upcoming shutdown of the gitorious.org service, caused by the company behind it being acquired by GitLab, I’ve moved my Git repositories to their proposed gitlab.com service. This includes the Git repos for Dianara and Auralquiz, which are now located at https://gitlab.com/dianara/dianara-dev and https://gitlab.com/auralquiz/auralquiz-dev. … and then just git pull as usual. Each project has an issue tracker right there now. Let me know if you find any issues with this move. Hello there! Since the blog looks a little dead, here’s a quick post! I haven’t done much coding lately, so not much to blog about. The development versions of some of my programs have had some minor updates, but not enough for a release. I’ve also adapted some of them to be Qt5-compatible. On a side note, sometimes I get visits from people looking for information on why Auralquiz doesn’t work for them. Well, all I can say for now is: use the Phonon-VLC backend. Phonon-Xine worked great with it, but was (and for the moment, still is) deprecated, and Phonon-Gstreamer has some problems with it, so… Phonon-VLC is the one that works for now. Sorry for the trouble. StressItOut v0.1 has been released. You can download it from Qt-apps. This overdue release fixes compilation with Qt version 4.8 and later, adds Ukrainian and Russian translations by Drool, an ALT Linux contributor, and has some basic lm_lensors support, along with other minor enhancements. StressItOut packages are available on Archlinux’s AUR service, and on Alt Linux repositories. StressItOut v0.0.013 has been released. – Basic system analysis and hardware detection. – Functional multi-threaded CPU test (very simple operations). – Semi-functional Memory test (just reads). – Functional 2D test (paints some primitives). – Functional OpenGL 3D test (paints a rotating pyramid). – Semi-functional Disk test (just reads). – Functional Optical drive test (reads and counts errors). – Dummy serial port test (no checking). – Parallel port and Network tests not implemented. You can get the latest source from Git, here. Last time I introduced a new program, DukeTrayem, as a fun side-project, but StressItOut, the burn/test application has seen several improvements since the previous blog post, which haven’t been explained. – There is a new “view” menu which allow setting full screen mode. – Translations to spanish and catalan languages are provided. 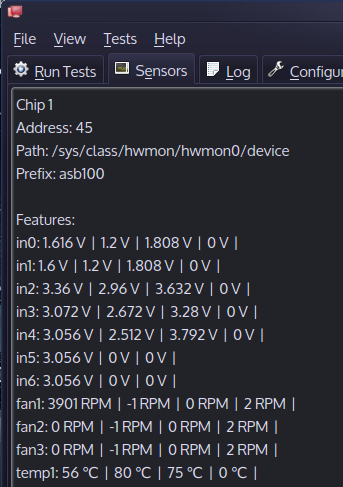 – The CPU load test is now real, with a configurable number of threads. – The Optical drives test is basically complete. – The memory test needs to be converted to using threads too, and more patterns, etc, but it has evolved, too. – Duration of the test can finally be set in hours and minutes. I also recorded a video. It’s uploaded, for now, to Youtube. I’ll upload it to blip.tv soon too. StressItOut has evolved quite a lot since the last blog entry. It has new tests, although they are almost dummies at the moment, the main menu works, there’s a new “log” tab which will hold detailed information during the test run, and some fixes here and there. And this is the not-so-new “configuration” tab, with a new (temporary) addition to enable the user to type the device names of the serial ports to be used by the serial port test. Tests that haven’t been created yet have been disabled. The code is hosted here on Gitorious. SIO is also on Qt-apps now. You are currently browsing the archives for the StressItOut category.